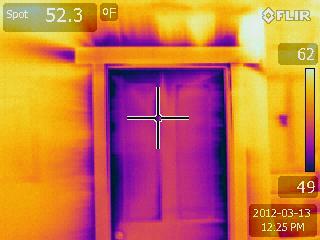 Thermal image of air leaks behind the trim, and at the poorly installed weatherstripping on the door. When doors are installed, there is generally a gap between the door frame (the part that the door closes against) and the studs in the wall. Trim is placed over this gap to make it look good. As you can see, the trim on this door is not air tight. There are a couple of ways of dealing with this situation. One is to use a low expansion foam when the door is installed. The other is to caulk all the seams of the trim. You could remove the trim, foam the frame, and re-install the trim, but that seems kind of obnoxious.